Here are my tips to selling your camper van, to ensure you sell it quickly and get a good price. Clean everything – inside and out. People will be turned off otherwise. Fix anything that is broken, or if you can’t, highlight anything that is broken. Get together as much documentation as you can find. This shows that you have cared for the vehicle. Top up the engine oil and water pots, as this shows you have maintained the vehicle. Get together as clearly show any accessories and tools you are including in the sale. It makes it look like you have more on offer. Highlight anything that is broken or does not work well. How would you feel if you were the buyer? In the window – Adverts in the window of the vehicle are one of the best ways to advertise it. People can easily see they type of vehicle, and assume a piece of paper in the window means its for sale. Always make the price really big writing, so that people can see it. The words ‘For Sale’ only have to be tiny. Always include as much information as possible, and your contact details. If you are not using the vehicle park it at a supermarket or at a busy road junction, where lots of people will pass it, see it and stop to look. Local paper – always a good choice. eBay – eBay.co.uk and eBay.com are great places to sell vehicle. People often get caught up in bidding wars and pay more than they would normally. In our forums – lots of people look there. Let us know about your selling tips and experiences in the comments below. Check it out on ebay!! 2006 Mercedes Vito 111 cdi conversion. 2 berth. 2.2 diesel automatic. Rock and roll bed. 2 hob stove with a pull out bbq at the back. 105000 on clock 12 months MOT. TV fitted in rear. Reversing camera and parking sensors. Only 54000 genuine miles but this will increase slightly as I do use it . Fridge, 2 ring gas cooker and grill, sink and tap, fresh and waste water tanks, propex heater, wardrobe and cupboard space, mains socket at the back plus internal 2 pin socket. Two of the internal lights have been upgraded to LED units. Roof rises to accomodate 2 kids for sleeping, driver and passenger seats convert to 2 single beds for adults. 2.3 108D Diesel. Tailgate needs a bit of attention as the blinds are coming loose and the black stuff around the window needs replacing. i’ve had a quote of about £280 for the work by Coast to Coast campers. It’s scheduled for around July 6th. Drivers seat cover is worn so could do with a re-cover. I am the 3rd owner since 2008 when i bought it from a neighbour. I am cleaning it at the moment. Rust on chassis underneath has been removed and waxoyl type stuff applied. Reason for sale – moving soon and I can’t store it and i refuse to park it on the road. I have just sold 3 motorbikes for the same reason. The previous owner kept a book with every detail of fuel fills and mileage, i carried this on. This van has seen us through a few festivals and some trips through Cornwall and France. New starter motor about 2 years ago but that that is the only thing that has gone wrong with it. New exhaust a couple of months back. Will be very sorry to see it go but needs must. Any questions just ask. Mazda Bongo For Sale – 1998 R Reg 55,000 miles, Full Service History since import, 12 months MoT to July 2016*, Very good condition inside and out, Climate control in front & rear, Power Steering, Auto Free Top – electric lifting mechanism, Radio & CD Player, Electric Front Windows & Mirrors, Electric Blinds & Tinted Side Windows, 240 Volt Hook Up, Leisure Battery, Two 3-Pin Plug Sockets & Additional Interior Lighting, Sink & Two-Burner Hob, Gas Bottle, Foldaway Table, Wardrobe and plenty of storage cupboards/units. Imported in 2006, Maintained and very well looked after, Rear wheel arches and sills in excellent condition, Cam belt replaced. Sleeps two below and two in the roof space – nearly new roof mattress, Curtains for front windscreen/drivers/passengers windows and rear. Rear conversion – kitchen/wardrobe/cupboard space to the rear with space between for transporting longer/larger items, Rear seats can move fully forwards and fold down to give plenty of boot space – great flexibility. Electric cool box included – can be connected to leisure battery or electric hook up and still used outside the vehicle, giving maximum space/storage inside. Only selling as just moved and want to raise some funds – unfortunately will have no time to use her. Very reliable – has never let me down. Please come and take a look if you’re interested. * MoT being done towards end of month. I have no concerns about her passing and if anything does need to be done, I will get this done so she can be sold with 12 months MoT til July 2016. Will also get air con re-gassed. hi, my name is talulah and im a 43 year old fun loving camper, i have a good sense of humour and a very outgoing personality. I still even today have the wolf whisltes so condsider myself to be a looker, my body is in fantastic shape for my age and i purr like a kitten when happy.I am a little bit of a flirt and do draw attention to myself everywhere i go. I love to be around people who appreciate the finer things in life and who realise that ladies are like fine wines and only get better with age. I am willing to have a quick romance with pretty much anyone and have plenty of miles left on the clock but Ideally i would like to find my life partner who will love me, cherish me and roll with the good and the bad. I was promised a life time of love from my current owners but now im being abandoned to make way for their new baby…..charming huh ! Drives as it should with no faults. White – minor age related marks on paintwork but overall condition very good. Clean Cab, no rips or tears. All units constructed using light weight ply wood- used to keep weight to a minimum and also impact and moisture resistant. or check us out on Facebook – Vanformation. 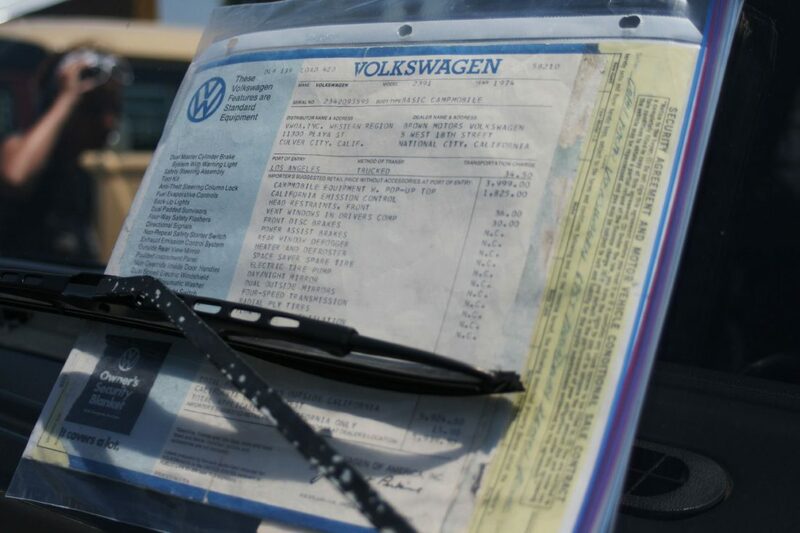 All original Owner’s Manuals and Docs. I have decided to part with my split Frisco, I was going to give this to my daughter when she passed her driving test, but last year she died and it holds so many memories that i am going to part with him. So it left Wolfsburg Germany on 16th June 1965 and went to San Francisco, and that is where i purchased him in 2008.
original paintwork with great patina on the roof. you wont find a drop of filler in him so you can bring your magnets with pleasure. Long on miles (170,000+) but otherwise in terrific condition. No dents, no damage, both inside and exterior are in excellent condition. We added solar a couple years ago to give us longer stays when not hooked up. Everything works. Tires are great, there are no oil drips, or other things that might make one leery of a van with this many miles. A mechanic went thru it last autumn, and made the comment that it was in such great shape for one with these miles. Only real negative, is that the paint has some sunburn, but nothing to be very worried about. Someone is going to end up with a great Westy, at a very good price. Our asking is $11,000. Van is located in Western Colorado. Drop me a note, and we will find a time to get together for a look and a test drive. Pictures at the link. Originally imported from South Africa by a company in Shrewsbury. First registered in the UK on 10/10/2009. It was said it had been used by a missonary in South Africa & there is a Afrikaans Bible in the glove compartment to add provenance to this story! Camper va runs well in need of TLC. Great potential . A good start for a restoration or keep it on the road with on going attention and some welding for MOT tax due end of July 2012. Door/ rubber seals need attention. One side underneath has had the work done afew years ago. My ‘Tribbie’ is reluctantly up for sale. It is 09 registered has all the usual features of a ‘tribbie’ and has been in the family since new. Useful extras are the reversing camera and the custom built hand brake. The gas is both LPG and standard (just in case!). Recession is biting the self-employed particularly hard – so our lovely VW Type 2 Bay camper van has to go. It’s a 1973 model with 1600cc engine and manual gearbox. We bought it only a year, from folk who had had a brand new interior installed. That’s new driver and passenger seats, new carpets at the front, new wooden flooring at the back, new units, new fold-down double bed, new one-plus-one jump seat, new dismountable table, new powered cool box fridge, new back cupboards, new sink (with electric submersible pump) and new cooker. We’ve replaced the exterior mirrors and the aerial with new items; there’s now a new CD/radio with i-pod hook-up; new, modern headlights with chrome visors, and a dinky spotlight which I haven’t wired in yet; and a new, super heavy duty battery. We also had a brilliant short-throw gear lever, and we’ve had the brakes completely re-built. It’s got a 240 volt hook-up facility. The spare wheel cover was new three months ago. The roof and skylight were new in 2011, and it was fitted with a new front axle. All in all, a really lovely job. 1972 Original Dormobile VW Campervan for sale. Pop up roof, gas stove and grill, sink, rock and roll bed, table and two hammock style beds in pop up roof. Good storage. Full MOT until Sept 2012 and tax exempt. Would suit for a project, runs well no probs with engine at all. Reluctant sale as we don’t have the time or expertise to really work on the campervan and there are some areas that need attention. There are some rust patches that need work (a panel at the back probably needs replacing)and one of the roof beds needs fixed as there is a rip in it. Accelator needs a new spring. A great wee van, given us lots of lovely memories! I heard that most people that are looking for a new and affordable camper may consider the use of an old ambulance because of the electrical and spacious features located in the back. I am selling my ambulance for 9,500 or the best offer. I AM willing to neogotiate. the truck has 59k original mi on it! i have plenty of pictures! Please could you furnish me with more details and perhaps photos if your van is still for sale? Can provide information on cheapest insurance and wealth of other good info for australians heading over for a camper holiday, all based on personal experience of 8 months touring UK/ EU in this car. Water heater, fridge, double bed, seating area, sink, hob, lots of storage space. WC room with portaloo, on board water tank, 12v spotlights, 12v, 240v hook up, Leisure battery with split charge system, 3 way fridge, removable table. The van is very clean and has just had cam belt and service done. Low mileage, drives really nice. It is a great little runner with a 1.6 petrol engine and I am having to sell it due to a change of circumstances at home. It sleeps 4 people with a rock and roll bed on the bottom that sleeps 2 and a pop up roof that sleeps 2 as well including storage. It has had welding done in april this year on the two front wheel arches and the right front step. It also has some surface rust found on the sliding doors and is currently MOT’d until April 2012 (no Tax though). The van has two sliding doors and the rear door opens completely to allow easy access. Inside the Van it features a gas powered fridge, a two hob stove and a grill and it also has a sink with an electric pump for a running water supply. Inside lights and water supply are powered by a leisure battery that is currently flat but charges when the van is driven and holds a good charge. The van also has a 12v electric hookup for when parked in a campsite that is great and means any electrical items like hairdryers, ipod docks etc can be used. I am looking for this to go to a good home and it does need some work doing on it which is mainly rust treatment and there are some advisories on the MOT. The campervan can be driven away and used for this summer. We are selling our well beloved Van! Had never any problems and it starts every time immediately! bed for 2 people (you can rebuild it for the day) including a big blanket, 2 pillows and bed linen, 2 chairs, 1 table , all dishes, gas cooker, laundry powder, street maps (for north and south island – latest kiwimaps), electric saw, SIM Card 2degrees, soap, dish washing agent, torch and oil, tape, some pieces of a mosquito net, blue key for the laundromat. There is also a 3rd seat for a passenger, 3 plastic boxes, dishwashing basket, clothes line, umbrella, Pioneer CD Radio, fuel can, real spare wheel, candelas, 2x10l water cans, fly and mosquito killer, electric freezer box. There is also enough space for your own stuff, were even able to cook inside the van when it was rainy! This is a great campervan! The back seats have been removed and a wooden frame built and replaced. Great for a road trip as the vehicle does not look like a campervan and therefore you can rock up anywhere and sleep overnight! Superb wooden trim round the edge thus the nickname “Woody”. Truly cared for Van! Excellent runner! Could get you from West Canada to East Canada no problem”! All camping equipment including: Pots, pans, Colemen double burner, fishing rod, tennis rackets, kettle, toaster, washed sheets. Secret lockable draw under passenger seat for valuables and passports. Fantastic car which we are sad see go! Reluctantly sale due to changing circumstances. 1989 Autotrail Comanche, 116000 km on the clock, Talbot Express base, 2.5 turbo diesel with air suspension Reliable and in good condition. UK registered, RHD, taxed end June, MOT end March. Completely refurbished inside and is spacious, light and lovely to take holidays in. Large lounge area which converts into 2 single beds or a huge king sized bed, blown air heating, new hot water boiler, new window blinds and roof vents. shower and bathroom, end kitchen with cooker, grill and hob, plus a 3 way fridge. All appliances in good working order. Plenty of storage over the cab and throughout. Bike rack and extra security lock fitted across the back entrance door. Extra interior locks and hidden safe for added safety. Must be seen to be appreciated. Contact [email protected] or 663572603. 2.0 litre ford transit camper for sale. its under 70,000 miles, power steering, MOT and taxed, fridge, double bed, cooker with x3 gas cylinders, sink with working tap and large water tank, under floor safe and lots of storage. comes with hook up cables and is ready to go. need to sell it due to a change in career. please just e-mail me for pictures and any more info. THERE ARE NO 3 POINT SEAT BELTS IN THE REAR, ONLY LAP BELTS BUT WE HAVE 2 ‘CRELLING’ HARNESSES WHICH ARE GREAT FOR CHILDREN AND CHILD SEATS. SHE IS A VERY GOOD MACHINE AND WORTH MORE THAN WERE SELLING FOR, BUT DUE TO THE FACT MY WIFE IS DUE TO GIVE BIRTH IN 2 WEEKS WE WOULD LIKE TO SELL HER, SO COME ON AND GRAB A BARGAIN!!!!! THIS VAN IS TAX FOR THE YEAR AND MOT UNTIL JUNE NEXT YEAR. SLEEPS TWO PLUS SINGLE AIR BED CAN GO IN THE CORRIDOR. RE CON ENGINE NEW STARTER MOTOR NEW ALTERNATOR ALL FITTED FEB THIS YEAR 2010. MILES THE ENGINE HAS DONE ONLY DONE 28000 MILES AS RECON ENGINE FITTEED. SERVICE AGAIN THIS WEEK DUE TO SALE. GENUINE REASON FOR SALE PRIVATE SELLER. WOULD SUIT HOILIDAY MAKER OR HOUSE BUILDER TO PARK ON SITE WHILES BUILDING A HOUSE. email if you’d like more info or pictures. I would love to see some pictures of your campervan. Please can you send me some? can easily cope, would you agree? I am selling my camperVan, a VW Transporter T4 from 1999, with 150000 miles. The van is converted with a bed, a gas cooker, facilities, etc.